Asphalt surfacing is a common surfacing type, often known as Tarmacadam. What is Asphalt & Macadam surfacing? Asphalts & Macadams are produced by mixing hot bitumen and aggregate. The material is then transported to the site in specially insulated trucks. The surface is laid and then compacted by a road roller. Once the fresh material cools to ambient temperature, it becomes sturdy enough for traffic. Callington Ltd offers services in Asphalt and Macadam works, contracts can be undertaken, varying in size from small areas which can be laid by hand to larger areas of several thousand square metres which are laid by paving machines. We offer a complete and expert service in all aspects of Asphalt & Macadam surfacing, consisting of skilled operatives, paving machines and all compaction plant. 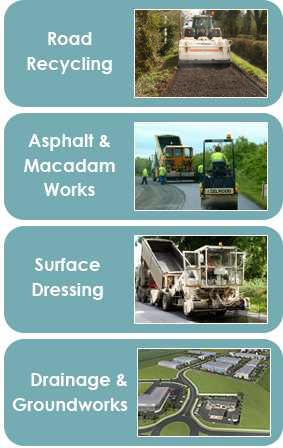 We provide a complete road surfacing solution, from the capping layer to final wearing course. This means that we can supply and lay clause 804 stone and subsequent layers up to the final wearing course layer, where we can provide and lay asphalt or hot-rolled chippings. We can also provide all grades of base course and wearing course to meet any budgetary requirements. No matter what the project requirements may be, our quality of materials and service is guaranteed. We offer unparalleled customer support at the concept, design, construction and maintenance stages of a project to ensure the long-term quality and structural integrity of the road surface. We can provide core sampling of the existing pavement to ensures that the correct grade of materials are applied to meet the needs of the underlying terrain.